Quirky Jessi: Fishing from the kitchen - This guy did it, why can't you? Fishing from the kitchen - This guy did it, why can't you? The answer is probably because you wouldn't go to such lengths this guy did....and you probably don't have this kind of underground river underneath your home. 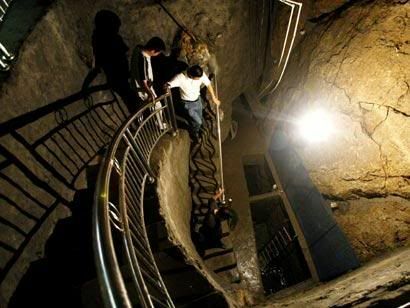 This Chinese farmer dug a 50 ft. hole inside his house to get to the river beneath, hauls in fish daily, and is making a pretty penny...er...yuan....for his efforts! Not bad at all! I used to see people fishing in oxidation ponds, so why not underground rivers? OMG... That is so bizarre. I swear, only the Chinese would think of something so genius. This is why people love the culture, wanna fish? 50 feet of dirt in the way? Dig!